Building information modeling (BIM) labs are becoming more commonplace at colleges around the globe — and rightfully so. They are used to design waterways, roads, bridges, buildings, factories, electrical grids, and a host of other modern infrastructures. The BIM software used by companies, academic institutions, and developers differ in that they are usually tailored for the project at hand. Most go beyond traditional 3D CAD-type software (such as Revit, Autodesk Building Design Suite, and Graphisoft’s ArchiCAD) by incorporating factors such as time of construction and cost. Depending on the project, other information is also typically incorporated in the customized software, such as the manufacturer’s details (product information and production) and even maintenance information and projected maintenance cycles over time. To get the latest crop of engineering students’ skills up to par, more colleges are turning to technoglogy companies to get the best visual equipment in their BIM labs for enhanced practical and theoretical teaching. 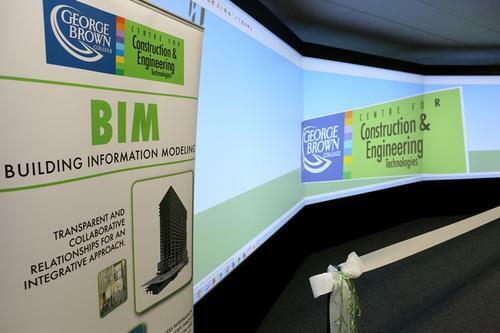 George Brown College in Toronto turned to Christie Digital Systems to stock the new BIM Lab at the school’s Centre for Construction and Engineering Technologies. The state-of-the-art lab will be outfitted with three large immersive screens that students can use to visualize, design, and collaborate with one another on all sorts of projects in a virtual reality setting. Three Mirage WU7K-M 120 Hz stereoscopic 3D DLP projectors, pumping out 6,300 ANSI lumens each, will powering those screens. The 55-pound projectors sport a 10,000:1 contrast ratio and have an HD resolution of 1,920p x 1,200p using a Widescreen Ultra Extended Graphics array (WUXGA). The Mirage projectors feature three modes of 3D input — the WUXGA (DVI-D) listed above, analog BMC, and frame-doubled DVI-D — which allows for multiple connection options for the PCs or servers being used. Dual Osram PvIP 200W LED lamps featuring 2,000 hours of life illuminate the projectors to provide bright, highly detailed images. These immersive projector adaptations for George Brown College are the first to be featured in Canada, but Christie has already outfitted two US college facilities: North Carolina State University’s James B. Hunt Jr. Library and Penn State’s Immersive Construction (Icon) Lab. NC State’s lab differs dramatically from George Brown’s; it was outfitted with Christie MicroTiles, projectors, and Spyder X20 video processors used for a variety of research projects as well as for a technology forum of sorts for lectures and social gatherings. The MicroTiles can connect with one another to form a display screen in almost any shape needed. The 16-inch x 12-inch cubes are outfitted with their own short-throw projector that produce an image from a LED light source and DLP optical micro-mirror device. Penn State’s Icon Lab functions in a way similar to George Brown’s lab, but it can run a string of laptops (up to 20) on any single display (using VNC connections), allowing for class participation. The engineers of tomorrow never had it so good, and chances are more of these BIM labs will be popping up all over the globe as they become more popular and affordable. Perhaps the makers of this technology should retool it for gaming. Version Control — Why Do We Need It? What Is the “Internet of Things (IoT)”?